Casa de Corujeiras is a lovely property set in an idyllic location looking down a valley with spectacular views over the vine terraces. Previously home to the estate workers, the accommodation has been converted into 5 villas. The villas are comfortably furnished in traditional country style typical of the area with pretty floral prints and rustic furniture. It is situated to the rear of the house and has a delightful covered terrace overlooking the vines and the countryside. It is the perfect setting for breakfast or early evening sunsets. There is a twin bedroom, separate shower room, small living/dining room and a kitchenette. Situated at the front of the house overlooking the lawn and pool. It has a twin bedroom with ensuite shower room, sitting/dining room and kitchenette. Upper floor – Double bedroom and twin bedroom both with ensuite shower rooms. Both bedrooms have wonderful views of the countryside. Lower floor – Sitting room and compact kitchen cleverly located under the stairs. Galleried double bedroom with skylight, shower room, small living area with patio and kitchenette. 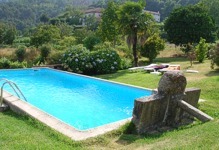 Lawns with mature fruit trees lead down to the swimming pool which is surrounded by tables and loungers. There is a poolside shower and a built in barbecue area which is available to all guests. The dimensions of the pool are 9 metres by 5 metres and the depth is from 1 to 2 metres. Casa de Corujeiras is close to Guimaraes, which is known as ‘ the cradle of the nation’ because it was the birthplace of the first king of Portugal, Afonso Henriques, who established his court there in the 12th Century. There are many interesting places to visit in the area including the city of Porto with the famous Port Wine houses, Braga and Amarante.